If it’s fall, it must be apple time! I have such fond childhood memories of going apple picking. Every year, we would visit Eckert’s in Millstadt, IL. We’d ride the wagon out into the orchards and fill our bags and our bellies with beautiful reds and greens. When we got home, my sister and I would pick out the prettiest ones to take to our teachers. Then Mom and my grandmother would make homemade applesauce and pies. It really didn’t get any better than that! My kids, however, being Florida born and bred, don’t know from annual apple picking. We took our oldest to an orchard one time when he was just shy of 2 and we were able to take the whole crew once when we were in Indiana in October. They still talk about that trip to this day! They say those apples straight from the tree were the best they’d ever eaten. My four may not be able to go apple picking every year like I was. But they do know something about their mom making applesauce. It’s become almost comical how excited they get when they see the crockpot out next to a big bowl of apples. And if they smell it when they walk in the door after school, they go completely bananas! I love it! 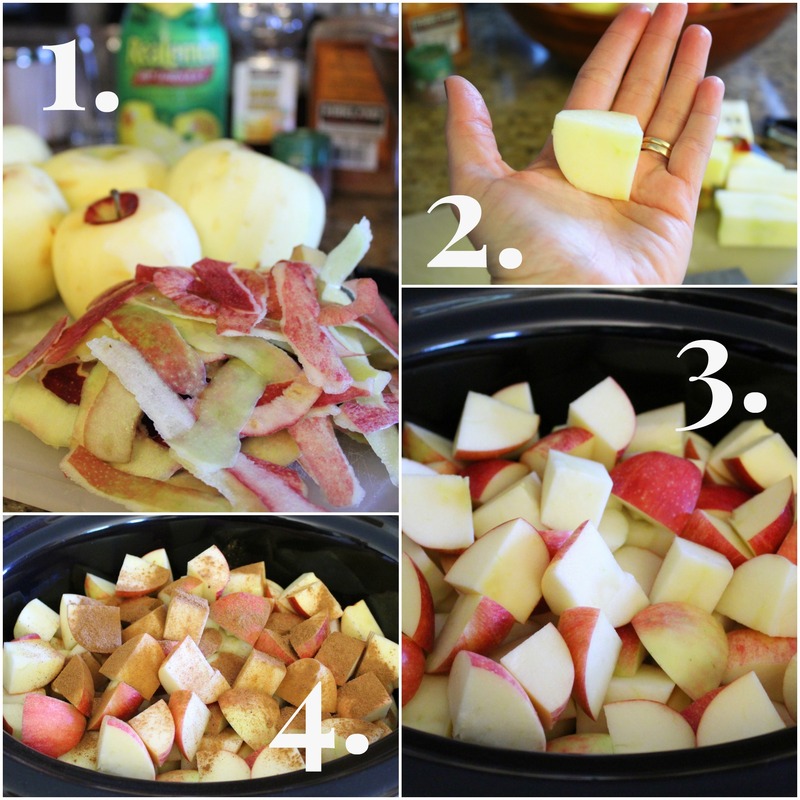 Now, whether or not you currently make your own applesauce, maybe I can convince you to give this method a try. It’s way easier than you think! Promise. It really just doesn’t get any easier. It gives me an excuse to use my immersion blender for something other than refried beans. The house smells absolutely divine while it cooks…and then the smell lingers on! My kids think I’m the best cook and mother ever when I make it. It isn’t at all watery like most store-bought brands. 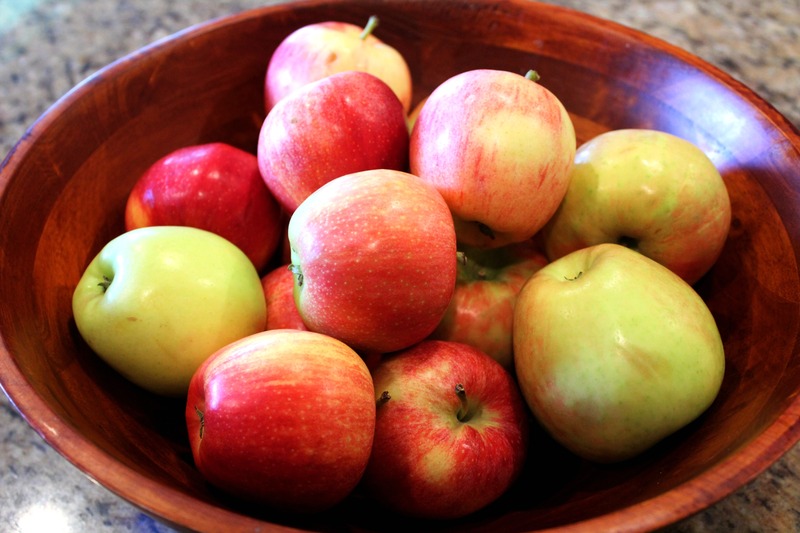 First of all, start with an absolutely gorgeous bunch of apples. I like to use a mix of varieties, but you should feel free to use whatever you have or whatever is on sale. This particular batch was made with a few honeycrisps, a bunch of gala, and one lonely little golden delicious. Sometimes, I’ll sub out the gala for fuji or use more golden delicious in place of honeycrisp. You get the idea. I just find it’s more interesting than sticking with one variety. And don’t freak out over a blemish here or there on your apples! That’s just extra sweetness, my friend. Then, wash your apples and peel about half of them. I like to leave some of the peel on for extra fiber and color in the sauce. It’s totally personal preference, though. Chop them into rather large pieces and toss them into the slow cooker. To the apples, add about a tablespoon of lemon juice, the cinnamon and nutmeg. Give it a toss. Cover and cook on low for 3.5-4 hours. 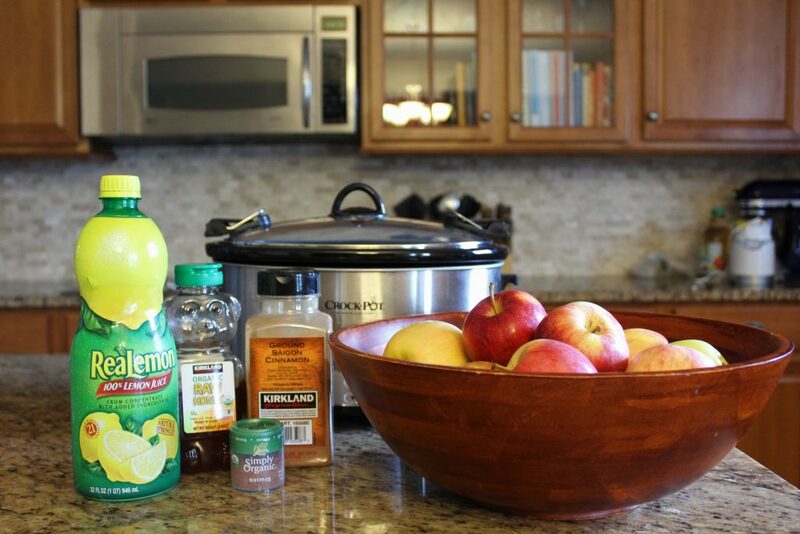 When the apples are done cooking and while they are still quite warm, pour some honey over the top. I’m not going to give you an amount because that will change due to several factors. The variety of apples you choose to use and your own tastebuds will determine how much sweetness to add, so start sparingly! 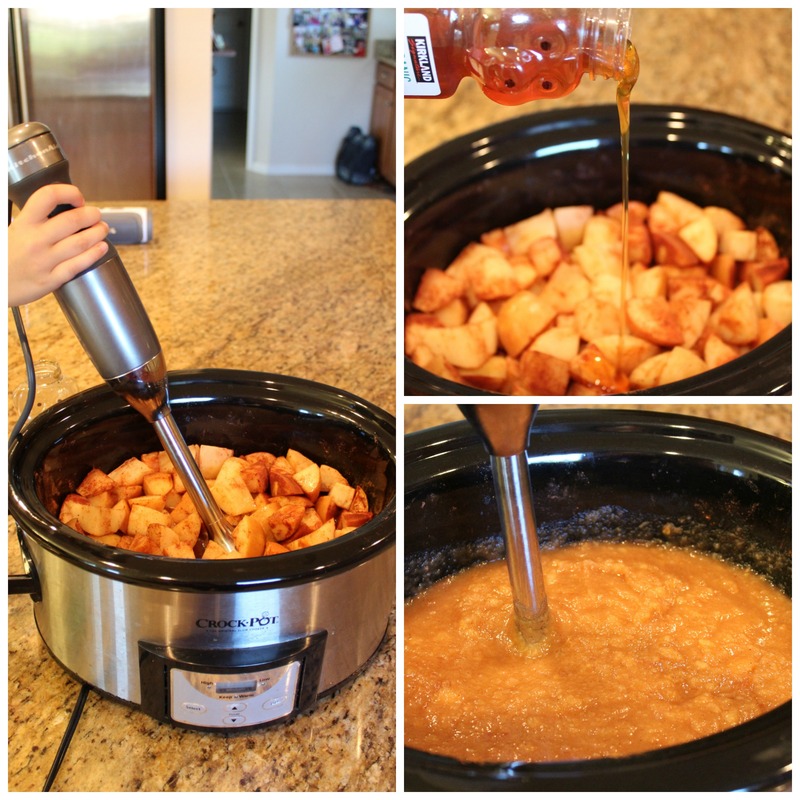 Then, using an immersion blender, pulverize your apples. We tend to err on the side of chunky at our house, but again that is up to you. Lucy gets rather upset if she can’t find apple bits in her bowl! 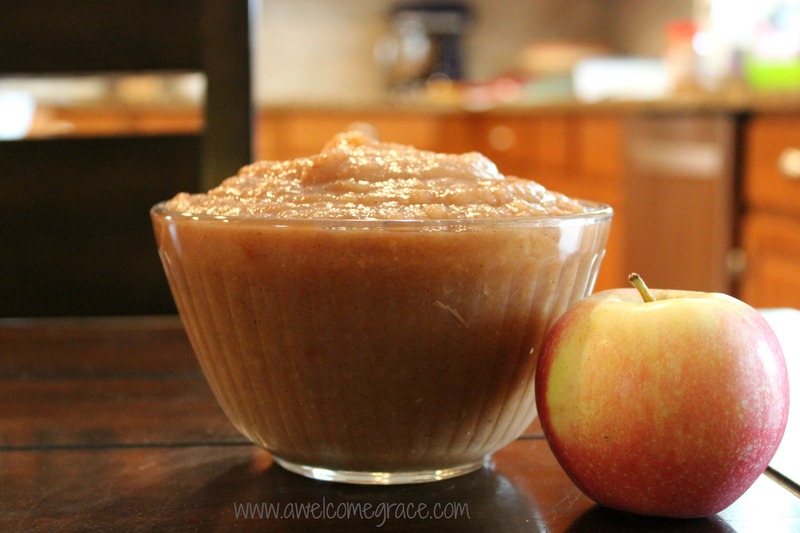 Let the applesauce cool on the counter for a while before putting it in the fridge. Serve warm or cold. I swear to you, this tastes just like the insides of an apple pie. It’s out of this world! And it just wouldn’t be fall at our house without it…even if it is still 92-degrees outside. Here’s the recipe! 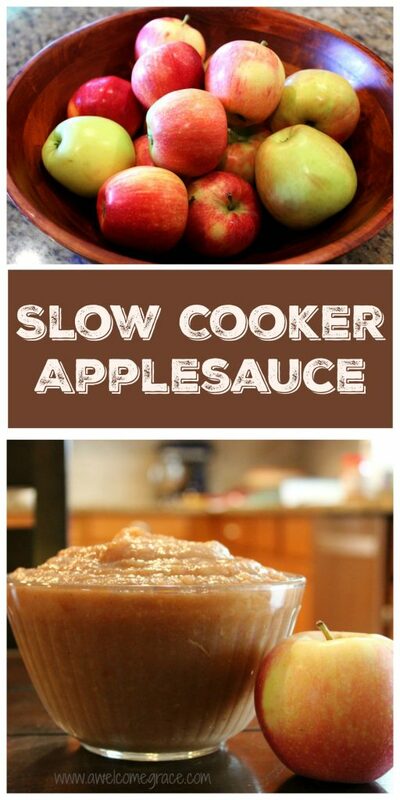 Slow Cooker Applesauce Click to download and enjoy!! I can’t wait to try this! I made some homemade apple butter a few years ago and it took a lot of tweaking to the recipe to get the taste right. Plus, it took way longer than the recipe said. Glad knowing this recipe is tried and true. Plus, I can use some of Osella’s family honey!